If you’ve driven through Kenney, Texas, you were probably going from Brenham to Bellville, or vice-versa. But if you actually stopped in Kenney, I know exactly what you were doing! 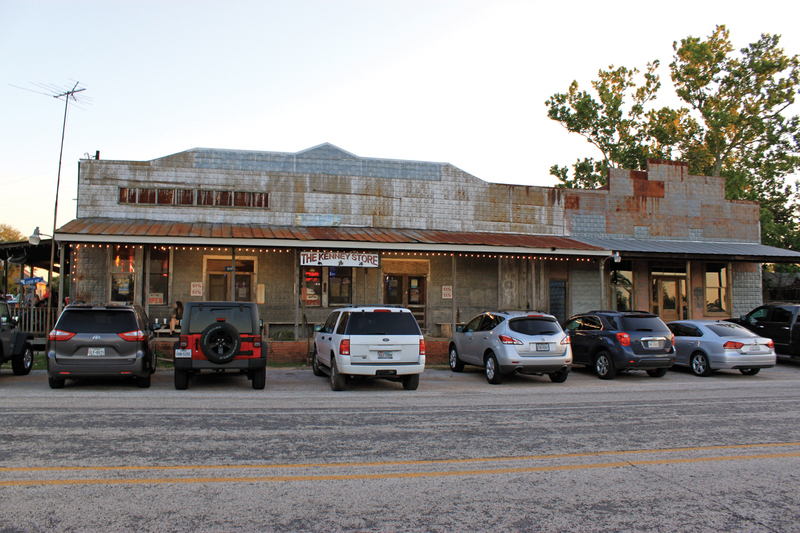 This northern Austin County “town” has been around since the early 1800s. In 1900, the population reached 200 and on paper, it maintains that number today. But the fact is, there is no town there any more. Like many ghost towns, there are still people living around the area, although to the casual traveler, it looks remotely rural. If it wasn’t for a road sign, you wouldn’t know it was there at all—well, except for the Kenney Store. On a casual drive through “town,” the Kenney Store is clearly the only business in existence. It looks like an old dilapidated tin structure held together by rust and duct tape. Yet every night the road in front of it fills with parked cars, sometimes a half mile in each direction, as people from Houston and San Antonio join those from Brenham and Bellville to eat and dance to the various live bands that play in this very old-fashioned roadhouse. No one knows for sure, but the locals claim the Kenney Store has been there since the late 1800s and while once, long ago, it actually was a store, the old timers say it always sold more beer than groceries. Back in the early 20th century, residents of Bellville, about eight miles away, would ride to Kenney on horseback in the evenings to enjoy the music and libations. The Bellville city fathers understood that horses heading toward home will start to hot-trot back to the barn and, unless held back firmly by the rider, will break into a dead run. They became concerned for the safety of inebriated citizens on the return trips. Knowing they lacked the law-enforcement manpower necessary to issue a sufficient number of RWIs (Riding While Intoxicated) to curb the problem, they decided instead to run a train from town to the store and back. While the resulting lack of traffic citations may have hurt the city coffers, it did reduce riding accidents and made it easier for Bellville residents to go out and have some fun. Today, well over 100 years later, the store has great burgers along with chicken fried steaks, sandwiches and even a few not-so-savory items like “calf fries.” Most important, though, it has beer and live music every night except Monday and unless you get there early, especially on weekends, you will end up standing the whole evening. It’s that popular. It was a Sunday evening and we had managed to score two steel tractor-seat stools at one of the bar-like tables along the top tier of seating. A few steps below us were some tables and the dance floor. We had already had a couple of burgers and enjoyed the first set by the band when the young couple next to me began to get up to leave. It was still early in the evening but the man was adamant that it was time to go. His wife and their two kids, who had been meandering around the place, insisted they stay for at least one more set. He told them he had a lot to do yet before he was ready for work the next day. Then he said something that got me thinking. I recently read a study in Psychological Science that said life satisfaction and happiness increased consistently over a person’s lifetime. In fact, they found that the oldest among us were indeed the happiest. At first this seemed perfectly logical. After all, as we get older, we tend to be more financially stable. That reduces our stress levels. Our families are formed, and we are established in our careers as well. Both of those can bring us comfort. Then, even later in life, we move toward retirement. Not having to go to work on a daily basis would certainly increase my happiness exponentially. But as I thought about it a bit more, I started to wonder. It is the older among us that tend to live on fixed incomes and to also have more health issues to deal with. It would seem these would serve as a curb to happiness levels. Yet the study indicated this trend remained even after factors like health, medical issues and income were taken into account. So what is happening here? When I was younger, I spent a lot of time thinking about where I wanted to be in five, ten, fifteen years. At age ten, I wanted to be a garbage man (riding on the back of the truck looked like fun). At 15, I wanted to be incredibly wealthy and retired by age 30. But then things got more realistic. At 20, I wanted to be a computer programmer, and at 25, I finally figured it out and decided I wanted to be a professor. With each of those goals firmly in mind, I spent my efforts doing the things I thought were necessary to get there. Sometimes I was very wrong in my planning, to say nothing about my choice of goals, but I was right enough of the time to get where I am today. I think that I am not very different from most Americans in this regard. We all spend a big chunk of our early adult lives working toward the goals we have set for ourselves and thinking about how glorious life will be when we get there. Then, as we get older, new goals replace those that have been accomplished. Our methods for achieving them, however, do not change. Whether we are shooting for security for our family, the kids’ college fund or our retirement nest egg, we continue to formulate goals and devote our time and efforts to achieving them. And more often than not, we continue to succeed. Even if we fail to meet a goal, we are closer to it for our efforts and are happier than we were to begin with. But if you think back, way back, it wasn’t always like this. As kids, we had other things on our minds, things like exploring and enjoying the world around us (and dreaming about riding on garbage trucks). Somewhere along the way, though, in our late teens or twenties, that all changed and we “grew up” and learned to take responsibility for our lives and our goals. Like that man in the Kenney Store, for decades we have kept our eyes on the prize, on that future goal we were striving to achieve. For him, it was a promotion to a better job, and hence, a better life for himself and his family. But I’ve noticed that for most of us, there comes a time when we stop doing that. For some, it happens at retirement. For others, it can occur many years earlier, but there is a point when our thinking begins to change. As humans, we have a tendency to lose track of who we are because of our constant obsession with who we are not. While working to better ourselves and our place in the world, we ignore what’s inside us for so long that we sometimes lose touch with who that person is. But at some point, with work and advancement concerns out of the picture, we begin to feel free to pursue the interests that are an integral part of our being. The retiree who travels, takes classes just for fun, or spends all his time with his loved ones, has managed to achieve the ultimate in human happiness. Work, money and all the related trappings that go with them become unimportant. His decisions instead are based on what makes him happy. Is it any wonder the researchers came upon their findings they did? It only makes sense. I wonder if there is a way to make that change in thinking happen earlier in life. If there is, I suspect we’d all be better for it. Was I daydreaming and setting future goals as we put those seeds in the ground? You betcha! Thanks for reminding me of a childhood memory I hadn’t thought of in a long, long time. « Is Fishing Still an Affordable Outing for Families?